"New Orleans Instrumental No. 2"
(1992) "Man on the Moon"
(1992) "The Sidewinder Sleeps Tonite"
"Man on the Moon" is a song by the American alternative rock band R.E.M., released as the second single from their 1992 album Automatic for the People. The lyrics were written by lead singer Michael Stipe, and the music by drummer Bill Berry and guitarist Peter Buck, and credited to the whole band as usual. The song was well received by critics and peaked at number 30 on the Billboard Hot 100 and number 18 on the UK Singles Chart. It remains one of R.E.M. 's most popular songs and was included on the compilations In Time: The Best of R.E.M. 1988–2003 and Part Lies, Part Heart, Part Truth, Part Garbage 1982–2011. Lyrically, the song is a tribute to the comedian and performer Andy Kaufman with numerous references to his career including his Elvis impersonation, wrestling, and the film My Breakfast with Blassie. The song's title and chorus refer to the Moon landing conspiracy theories as an oblique allusion to rumors that Kaufman's death in 1984 was faked. The song gave its name to Man on the Moon (1999), Miloš Forman's film based on Kaufman's life, and was featured prominently in the film's soundtrack. "Man on the Moon" is a mid-tempo country-rock song following a verse-chorus structure with an added pre-chorus and an instrumental bridge following the second and third choruses. The song is somewhat unusual in that the verses are unequal in length, with six lines in the first verse but only four in the second and third verses. An early instrumental demo of the song was known to the band as "C to D Slide". Guitarist Peter Buck has explained how the music came together: "'Man on the Moon' was something that Bill [Berry] had, this one chord change that he came in with, which was C to D like the verse of the song, and he said: 'I don't know what to do with that.' I used to finish some of Bill's things ... he would come up with the riffs, but I would be the finish guy for that. I sat down and came up with the chorus, the bridges, and so forth. I remember we showed it to Mike and Michael when they came in later; definitely we had the song finished. I think Bill played bass and I played guitar; we kept going around with it. I think we might have played some mandolin on it in the rehearsal studio." Michael Stipe later explained in an interview with Charlie Rose how the lyrics were written independently of the music, which had no prior association with the song's eventual lyrical content regarding Kaufman. Stipe recounted that the rest of the members of R.E.M. had written and performed the music of the song and recorded it along with the rest of the Automatic for the People album during studio sessions in Seattle. As of the final week of the recording sessions, Stipe was still struggling to write lyrics for the song, and the other band members continued to plead with him to finish it. Stipe attempted to argue that the track should be an instrumental, but his bandmates were insistent. Stipe listened to the track on a walk around Seattle on his Walkman cassette player and was inspired to write about the performances of entertainer Andy Kaufman. After Stipe went back to the studio to complete the vocal track, the master was mixed that night and sent out the following day to be mastered. He's the perfect ghost to lead you through this tour of questioning things. Did the moon landing really happen? Is Elvis really dead? He was kind of an ephemeral figure at that point so he was the perfect guy to tie all this stuff together as you journey through childhood and touchstones of life. Other lyrical references include persons from the history of science and religion, as well as board-games and the rock band Mott the Hoople of whom Stipe had been a fan in his youth, and whose music he associated with the years of Kaufman's original television broadcasts. Regarding the cryptic lyrics, critic Greg Kot wrote that the song "presents a surreal vision of heaven." According to Ann Powers, "Mentioning Kaufman in the same breath as Moses and Sir Isaac Newton, Stipe makes a game of human endeavor, insisting that it all ends in dust. 'Let's play Twister, let's play Risk,' Stipe jokes to the notables he's invoked. 'I'll see you in heaven if you make the list.'" The lyrics to "Man on the Moon" also feature a prominent repeated refrain of "Yeah, yeah, yeah, yeah". Stipe has explained that his friend Kurt Cobain was in the habit of placing "yeah" in the lyrics to the songs of his band, Nirvana, and that Stipe intended to outdo him, even to the extent of counting the "yeahs". "Man on the Moon" was released as the second single from Automatic for the People on November 21, 1992, reaching number 30 on the Billboard Hot 100 and number 18 on the UK Singles Chart. The song was enthusiastically received by critics. Writing for the New York Times, Ann Powers said it "shines with a wit that balances R.E.M. 's somber tendencies." Stewart Mason went even further in his review for Allmusic, calling the song "near-perfect", "almost inarguably Stipe's pinnacle as a singer", and "one of R.E.M. 's most enduring achievements". The song was listed at number 19 on the Village Voice "Pazz & Jop" year-end critics' poll in 1993. The song's video, directed by Peter Care, was shot over three days in the desert, at Lancaster in the Antelope Valley area of California, in October 1992. Care kept a journal of the unusually long planning, filming, and editing process, which was published by Raygun magazine and reprinted in the R.E.M. fan club newsletter. It gave a clear idea of the amount of work, money, and attention-to-detail involved. The video depicts Michael Stipe, attired in a cowboy hat, walking along a desert road before leaping onto a passing truck (driven by Bill Berry) and hitching a ride to a truck stop where Peter Buck is tending bar and Mike Mills is shooting pool. Berry trades his truck seat for a bar stool, and along with a few of the other customers (in the shooting, they used actors and non-actors), sings along during the choruses. Stipe eats an order of fries, and then leaves and walks back into the desert. The video is punctuated with Moon-related images, including footage of the NASA Moon landings, an orrery in motion and a clip from Georges Méliès' 1902 film, A Trip to the Moon. Television footage of Kaufman wrestling and impersonating Elvis Presley is also shown. This video, which uses the shorter version instead of the full album version, was ranked #41 on Rolling Stone magazine's The 100 Top Music Videos, and has been described as 'iconic' by the NME's Andrew Trendell. All songs written by Bill Berry, Peter Buck, Mike Mills and Michael Stipe except as noted. ^ a b c Mason, Stewart. "Song review: Man on the Moon". Allmusic. Retrieved 29 January 2012. ^ Greene, Andy (28 September 2011). "Readers Poll: The 10 Best R.E.M. Songs". Rolling Stone. Retrieved 28 June 2017. ^ Kelly, Casey; Hodge, David (2011). The Complete Idiot's Guide to the Art of Songwriting. New York: Alpha Books. ISBN 978-1-101-54337-5. 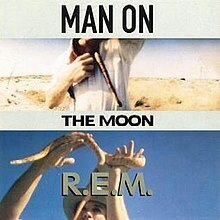 ^ a b c d "REM talk to us about the classic 'Man On The Moon' to mark the single's 25th anniversary". NME. 21 November 2017. ^ a b "R.E.M. Reflects On 25 Years Of 'Automatic For The People'". NPR. 2 November 2017. ^ Staggs, Matt (17 September 2014). "Memoir in a Melody: R.E.M. 's Ode to Andy Kaufman in 'Man On the Moon'". Signature. Penguin Random House. Retrieved 28 June 2017. ^ "Michael Stipe looks back at Automatic For The People 25 years on and living with the fear of HIV for 10-years". The Sun. 17 November 2017. ^ Kot, Greg (October 4, 1992). "Killing 'Em Softly". Chicago Tribune. ^ a b Powers, Ann (October 11, 1992). "A Weary R.E.M. Seems Stuck in Midtempo". The New York Times. Retrieved 29 January 2012. ^ "R.E.M. : Billboard singles". Allmusic. Retrieved 29 January 2012. ^ "Man on the Moon". Chart Stats. Retrieved 29 January 2012. ^ "The 1993 Pazz & Jop Critics Poll". Robert Christgau. Retrieved 29 January 2012. ^ Gray, Marcus (1997). It Crawled from the South: An R.E.M. Companion. Da Capo Press. ISBN 0-306-80751-3. ^ "Australian-charts.com – R.E.M. – Man on the Moon". ARIA Top 50 Singles. Retrieved 22 March 2018. ^ "Austriancharts.at – R.E.M. – Man on the Moon" (in German). Ö3 Austria Top 40. Retrieved 22 March 2018. ^ "Ultratop.be – R.E.M. – Man on the Moon" (in Dutch). Ultratop 50. Retrieved 22 March 2018. ^ "Top RPM Singles: Issue 1781." RPM. Library and Archives Canada. Retrieved 22 March 2018. ^ "Offiziellecharts.de – R.E.M. – Man on the Moon". GfK Entertainment Charts. Retrieved 22 March 2018. ^ "The Irish Charts – Search Results – Man on the Moon". Irish Singles Chart. Retrieved 22 March 2018. ^ "Dutchcharts.nl – R.E.M. – Man on the Moon" (in Dutch). Single Top 100. Retrieved 22 March 2018. ^ "Charts.nz – R.E.M. – Man on the Moon". Top 40 Singles. Retrieved 22 March 2018. ^ "Official Singles Chart Top 100". Official Charts Company. Retrieved 22 March 2018. ^ "REM Chart History (Hot 100)". Billboard. Retrieved 22 March 2018. ^ "REM Chart History (Adult Contemporary)". Billboard. Retrieved 22 March 2018. ^ "REM Chart History (Alternative Songs)". Billboard. Retrieved 22 March 2018. ^ "REM Chart History (Mainstream Rock)". Billboard. Retrieved 22 March 2018. ^ "REM Chart History (Pop Songs)". Billboard. Retrieved 22 March 2018. ^ "REM Chart History (Radio Songs)". Billboard. Retrieved 22 March 2018. ^ "RPM 100 Hit Tracks of 1993". RPM. Archived from the original on August 24, 2017. Retrieved November 23, 2017.